Treat your next grilled cheese panini to something exciting. And by exciting we mean freshly sliced mushrooms and the distinctive flavour of BULL'S-EYE Barbecue Sauce. Add butter and mushrooms to small nonstick skillet. Cook and stir on medium heat 5 min. or until mushrooms are tender, stirring in the barbecue sauce for the last min. Fill bread slices with mushrooms and Singles. Spray both sides of sandwich with cooking spray. Grill sandwich 2 min. or until golden brown. Serve with fresh fruit and a quick bagged salad tossed with your favourite Kraft Dressing. 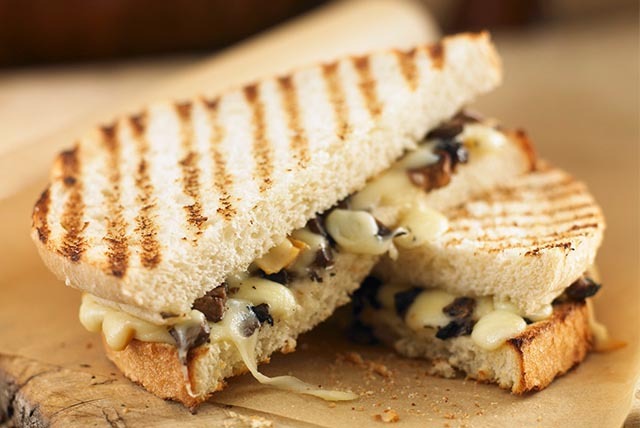 Substitute a skillet for panini grill when preparing sandwich.